By Phillip Rathousky, D.O., Dennis P. Vollman, D.O., Ben Dwamena, M.D. A 59-year-old man with a history of a splenectomy presented with bacteremia from an uncertain source. In-111 white blood cell (WBC) imaging was performed. An indeterminate round focus of uptake was noted in the left upper quadrant (LUQ) of the abdomen (Figure A). 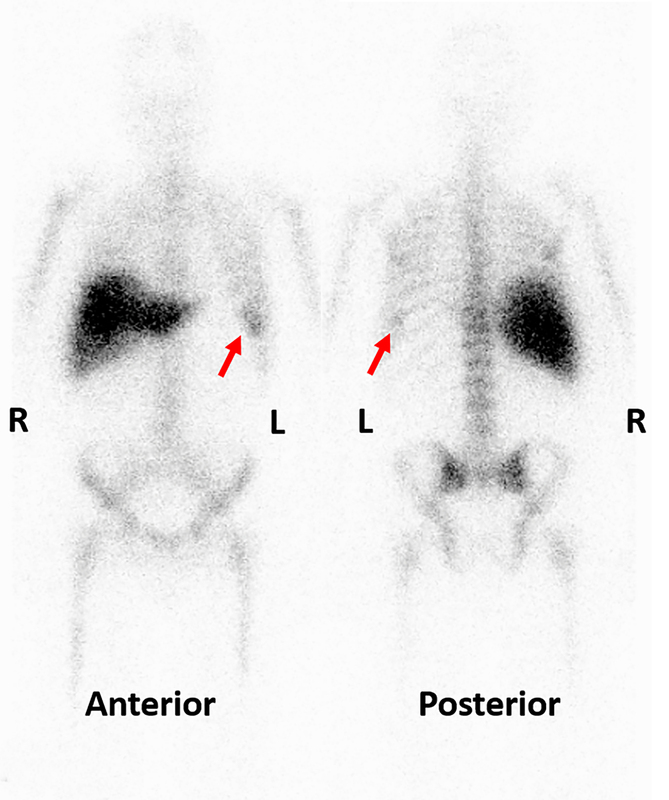 For further characterization, a SPECT/CT of the abdomen was performed (Figures B, C). Post splenectomy, no uptake would be expected in the LUQ, making this finding suspicious. On SPECT/CT, the uptake localizes to a small round soft-tissue mass. Differential diagnosis could be based on either the nuclear or CT findings and are best categorized as: infectious, neoplastic, and normal variant (residual splenic tissue). A variety of infectious processes demonstrate focal increased uptake on leukocyte scintigraphy. Both radiolabeled and nonradiolabeled leukocytes accumulate at sites of infection due to the immune system inflammatory cascade resulting in chemotaxis, a shift of leukocytes from the blood stream to the site of infection.1 Although nearly any infectious process could be responsible for the uptake, the differential is primarily based on location within the LUQ and includes diverticulitis, pancreatitis, and abdominal abscess. An abdominal abscess is a localized collection of purulent infected fluid. Typical CT appearance of an abscess is a hypodense, loculated fluid collection with rim enhancement. Internal gas in the absence of surgical intervention is highly suspicious for an infected collection. In the LUQ, an abscess may result from pancreatitis, diverticulitis, or from a postsurgical complication such as from a splenectomy. Whenever an abnormal soft-tissue lesion is encountered on CT, neoplasm should be considered by the interpreting physician as a diagnostic possibility. Although the mechanism is not well understood, a variety of noninfected malignancies occasionally demonstrate increased uptake on radiolabeled leukocyte imaging.5 The differential is usually limited based on the organ in which the mass is visualized. However, this case presents as a stand-alone soft-tissue mass in the LUQ without a clear visceral origin. Given this anatomic finding, a variety of malignancies should be considered. Peritoneal carcinomatosis is a result of peritoneal spread of certain neoplasms, most commonly ovarian and gastrointestinal adenocarcinomas. The classic “omental caking” results in conglomerate masses and nodularity throughout the omentum. However, occasionally more discrete soft-tissue nodules (peritoneal seeds) are the primary finding. Although much less common than metastases, primary malignancies arising from the peritoneum, such as malignant mesothelioma, should be considered. Malignant mesothelioma is a rare condition with an extremely poor prognosis. Most mesotheliomas arise from the lung pleura, while primary peritoneal mesotheliomas account for only 6% to 10% of cases.6 As with pleural mesothelioma, peritoneal mesothelioma is associated with asbestos exposure. Omental caking and malignant ascites are often present. Splenules are benign foci of congenitally ectopic splenic tissue, often considered variations of normal anatomy. They appear as small rounded nodules most commonly near the splenic hilum. Splenules demonstrate similar characteristics to the normal spleen on all imaging modalities. 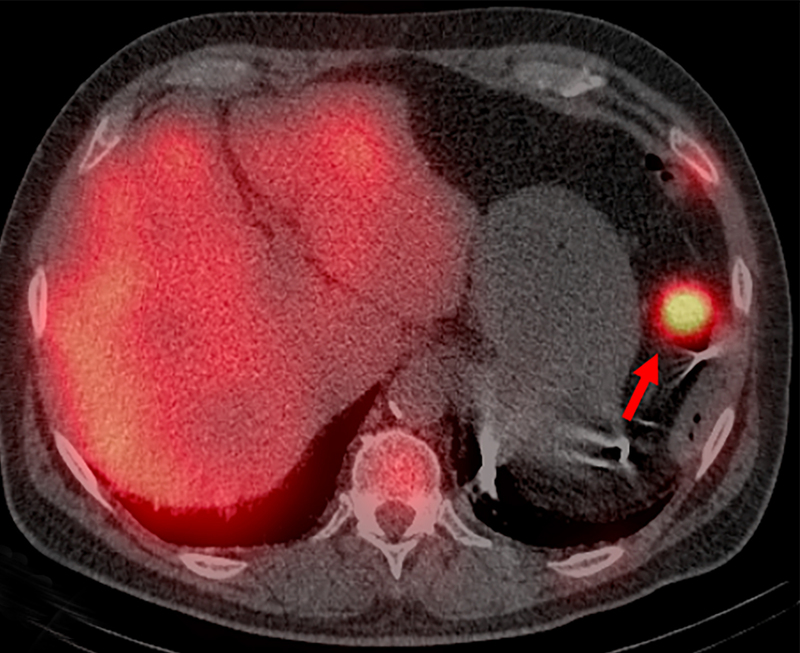 Given that it is part of the hematopoietic system, splenic tissue demonstrates intense uptake on radiolabeled leukocyte imaging and is considered part of a normal biodistribution of the radiopharmaceutical. Whether congenital or post-traumatic, these splenic foci can often be mistaken for other pathology, including malignancy. 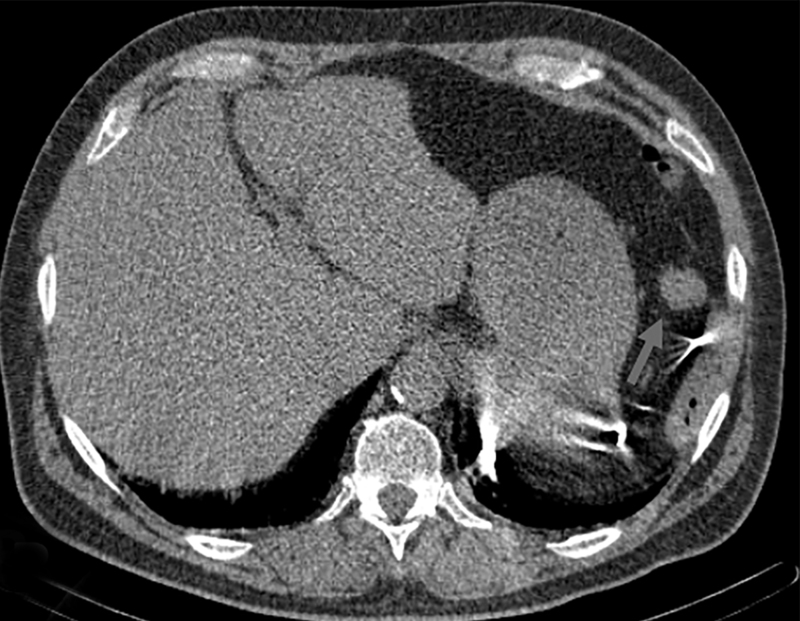 Further complicating the diagnosis, these foci of residual splenic tissue can enlarge if the spleen is removed, mimicking a more aggressive process. Leukocyte scintigraphy plays a useful role in the workup of patients with suspected infection. This case is an example of a relatively nonspecific focus of uptake on planar scintigraphy being better characterized on hybrid SPECT/CT imaging due to improved resolution and precise anatomic localization. An initially broad differential was narrowed combining imaging findings with the clinical history. Although infection is usually the primary consideration of any abnormal focus of uptake on leukocyte scintigraphy, the CT appearance in this case was not consistent with infection. Additionally, it would be unusual to see intense focal radiopharmaceutical uptake on leukocyte scintigraphy in a peritoneal malignancy without other evidence of malignancy on this exam or by history. The clinical, CT, and scintigraphy findings were all concordant with residual splenic tissue, making this the most appropriate diagnosis. An awareness of the normal biodistribution of radiolabeled leukocytes combined with the precision of SPECT/CT correctly identified this focus of unusual uptake as a variant of normal anatomy, avoiding the misdiagnosis of an infection in the abdomen. Ziessman HA, O’Malley JP, Thrall JH, et al. Infection and inflammation. In: The Requisites: Nuclear Medicine, 4th ed. Philadelphia, PA: Saunders; 2014:322-349. Love C, Palestro CJ. Radionuclide imaging of inflammation and infection in the acute care setting. Semin Nucl Med 2013;43(2):102-113. Lamki LM, Kasi LP, Haynie TP. Localization of indium-111 leukocytes in noninfected neoplasms. J Nucl Med 1988;29(12):1921-1926. Levy AD, Arnáiz J, Shaw JC, et al. From the archives of the AFIP: primary peritoneal tumors: imaging features with pathologic correlation. Radiographics. 2008;28(2):583-607. Lake ST, Johnson PT, Kawamoto S, et al. CT of splenosis: patterns and pitfalls. Am J Roentgenol 2012;199(6):W686-693. Rathousky P, Vollman DP, Dwamena B. Focal Uptake in the Left Upper Quadrant on an In-111 White Blood Cell Study. J Am Osteopath Coll Radiol. 2018;7(1):26-28. Phillip Rathousky, D.O., Dennis P. Vollman, D.O., Ben Dwamena, M.D.